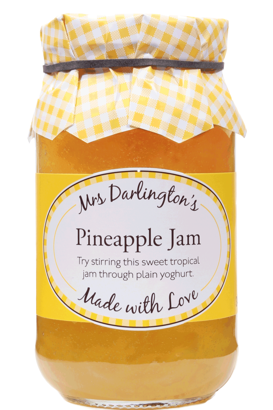 Bursting with sweet, juicy tropical pineapple, this is paradise in a jar. Try stirring this sweet tropical jam through plain yoghurt. Made with Love and suitable for Vegetarians & Vegans and a Gluten Free diet. Refrigerate once opened. Ingredients: Sugar, pineapple, gelling agent: pectin, citric acid.